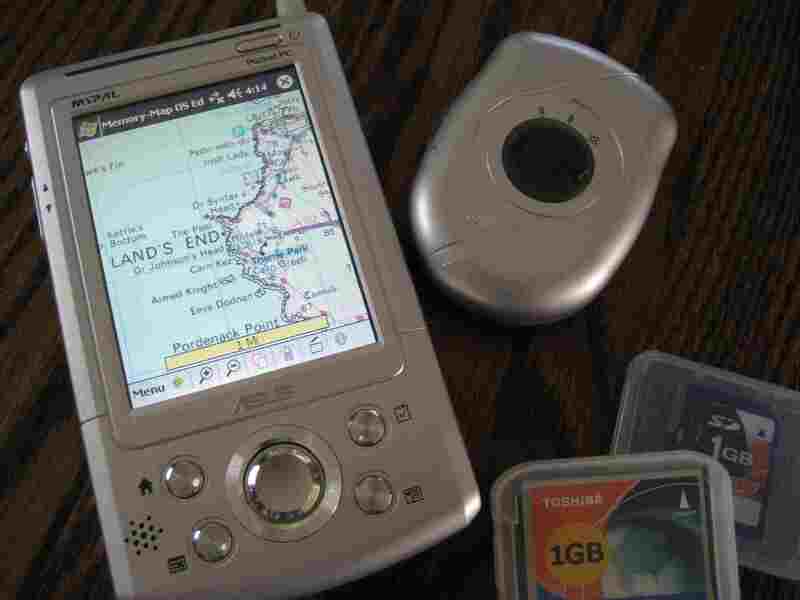 Electronic map on my PDA with the GPS. Below: St. Michael's Mount. 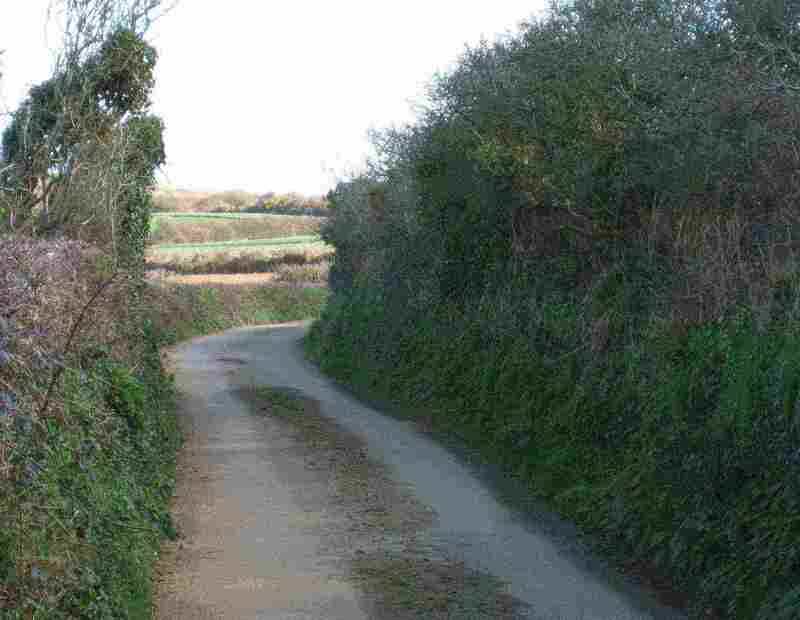 Foot of page: Typical Cornish lane. I am a 63-year-old American of British origin. With my wife, Jennifer, I’ve lived in America since 1967, i.e., for 40 years. I’ve visited Britain occasionally since, and stayed there briefly in about 1970, but I hadn’t really experienced British life at street level, so to speak, for a very long time. For me, this was not only a hike; it was both an adventure into the past, and a discovery of the present after a long absence. Already, the comparisons between “then” and “now” were stark. Today, there are freeways (motorways) and divided-highway A-roads on which I’d covered the 300 miles to Penzance from London in record time. Previously, all trunk roads in Britain involved sporty, stressful, stop-and-go agony on curved roads with incessant traffic. These mainly-undivided highways had been Britain’s only transportation arteries until the late 1950s when the M1 motorway was built, and were only really supplanted from that role after additional massive freeway construction and A-road improvements through the 80s and 90s. In that process, city centers were freed from truck traffic, and the larger trucks then permitted on the new trunk roads dramatically lowered the cost of distributing goods. Together with North Sea oil, capitalist policies, and the curtailment of union excesses, this revolutionized the British economy. The city centers flowered again, with pedestrian precincts for livability, and a civic-mindedness that emerged from a traffic-buried and revenue-lacking past. Parking is still an issue, but with some exceptions like inner London, access and speed are not. And people have more money to spend - quite a lot of it. Now, as I left Penzance along a coastal path to the east, I was back to the basics of boots on the ground, and unlikely to experience the inside of a car or bus or train for perhaps two months. The only traffic I had to worry about was beside me on the roads. And I was poor again, just as in 1967, partly because the American dollar had slid over the same period as British prices had risen, and partly because I had a very long visit to pay for. After passing the town of Marazion, and St. Michael’s Mount, on the right, I turned left (northeast) and went inland. 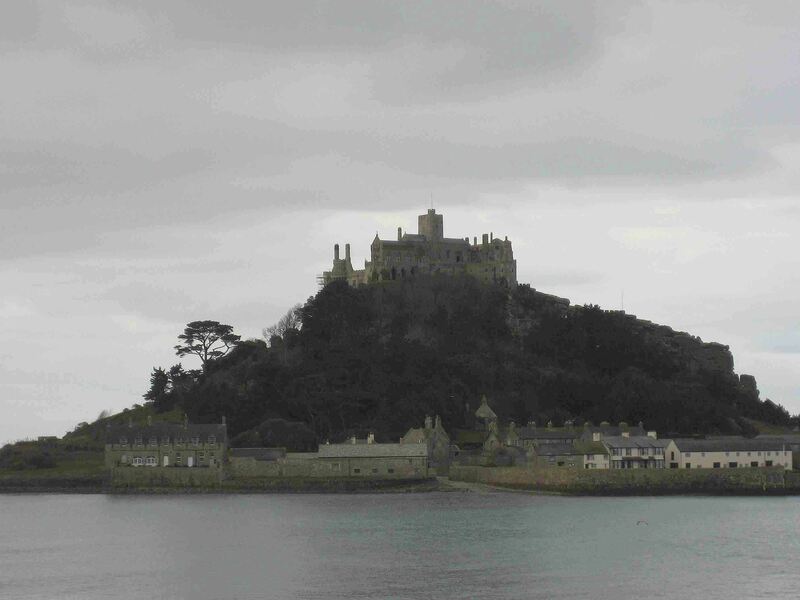 St. Michael’s Mount is geographically sister to Mont St. Michel in Brittany. Both are hilly islets, crowned with an abbey, and connected to the mainland by a causeway accessible only at low tide. It was high tide as I passed, and sightseeing was not on my agenda anyway. In turning my back on the coast, I departed the famous South West Coast Trail, a 630-mile path as fine as any in Europe and of considerable difficulty as it follows the coast with its inlets, cliffs and beaches. Paul Theroux documents some of it in his traverse of the British coast, described in his book Kingdom by the Sea, which also speaks to the character and mood of Britain in the weary days about the time I emigrated. In leaving the coast now, I also turned my back on Cornwall’s smuggling history. Not far from here is Prussia Cove, named for the "King of Prussia" as Captain John Carter described himself. He and his brothers ran an enormously successful smuggling operation between this cove and France. Prussia Cove was just two miles south of my route, but – as I thought it then – too far to detour to. This cove, and its neighboring Trevean, Stackhouse, Piskies and Bessy’s coves, is made for smuggling. Prussia Cove is said to be almost invisible from the land, being surrounded by cliffs, which lean outwards to block the view of the cove from above. A series of caves and tunnels, and tracks carved into the cliffs, enabled access to sea level. From the sea, where access was easier, history records that the smugglers sometimes fought with men-of-war, operated by the equivalent of today’s Coastguard. Much of this is documented by John Carter’s brother, Harry, who hid out at safe houses in Marazion before turning to Methodism and writing his autobiography. The isolation of Cornwall in these years (approximately 1750 to 1850) undoubtedly facilitated smuggling, and the Carter’s were not the only ones in the trade. The Gilbert and Sullivan opera, The Pirates of Penzance, was of course not named for Penzance without reason, since piracy and smuggling went hand-in-hand. As I headed inland, Cornwall now revealed itself in ways new to me. Up hill and down dale went the roads – steeply and incessantly – and up and down went my pulse. It seems the road-builders made sure they connected the bottom of each valley with the top of each hill. Well-surfaced and drained these roads were, and fortunately with very little traffic on today's rural routing in winter, but they extracted a price in pain and sweat. Once inland by just a mile, I entered a rural world unknown to many foreign visitors, where there were no retail outlets of any kind for miles, except for one pub, and a roadside stand selling horse manure for 50p ($1) a bag - "return the bag". It was just as well that I had packed my lunch. The route passed through farmland (livestock, vegetables, and flowers), and there were too few people to merit a roadside seat or picnic table. Consequently, my rest stops were mainly on roadside banks, as wet as I described yesterday, though the forecast rain did not arrive until I reached the driveway of my destination farmhouse at about 2.30 pm. Last night at Penzance, I had finally got operation of the GPS down to a systematic process, instead of a pecking hunt. It seems that one mustn't open the GPS with the GPS viewer program at all even though it reassuringly shows the satellite signals that the GPS receiver has acquired and gives a text statement of one's coordinates. Once you do this, the GPS won't work with the electronic maps on my PDA (personal digital assistant). What does work is to let the maps talk to the GPS receiver by themselves without first testing the GPS. Once I learned this, my position could be shown on the electronic maps at will. "At will" did not, however, mean quickly. Getting the wireless connection established between the GPS and the maps could take some time. The first five miles were easy enough. The next five miles were enlivened by missing a right turn near Perran Downs and recovering from it by eventually using the GPS and finding an alternative route through Halamanning and the local dump, adding not much distance but some rough, winding terrain through gorse. I got back to my intended route at Millpool. There is something uplifting about getting lost in the great outdoors. In days gone by, I have experienced this in the woods but seldom in the open. In both cases, the heartbeat quickens, adrenaline pumps, and a drumbeat starts in the neural pathways urging one to right what is wrong. Then finding one's path back to where one wants to be shuts off the adrenalin flow, removes the stress - and the neural drumbeat goes into diminuendo and whispers to stillness. The whole thing can be quite a "turn on". The final five miles, after Godolphin Cross and through Nancegollan, were extremely arduous, and made possible it seemed only by the lure of the destination. Though fatigued at the end of the day, I was pleased that my legs had held up well. The pack weight gave me bad shoulder pain, however. I received a goodbye call from my wife Jennifer tonight at the B&B. She was about to return to the States. Her call left me with a lump in my throat. Mel and Ann Larkins were my charming hosts at their farm. Mel collects old tractors, which intrigued my engineering heart but not enough to distract me from resting in my comfortable bedroom with a view over a meadow with goats. The four stars I gave Higher Bosoha Farm are as many as you'll see on any of my B&Bs in these beginning days. There are some B&B hosts one could easily make friends with, and Mel and Ann are among them. Sadly for their visitors but not for them, they've since retired and gone traveling.